November 21st for Venice is FESTA DELLA MADONNA DELLA SALUTE(about the feast: read the article below from Venezia.net). Just to add what the article did not include as to why "OTHERS" consider it A MUST CELEBRATION TO ATTEND. For some, its because of the 'fritelli' (fried dough bathe in sugar or stuffed with abundant Nutella .... hhmmmnnn yummy). Take note also that 'Salute' means health. Another is the festive mood enjoyed by the kids and making their parents buy these balloons of their favorite cartoon characters. Just like Lukie and his dear 'Spongy' Bob. Inside the church, all the Jewels of the Madonna and Baby Jesus are real gold. So are the linings of the altar table and most part of the shrine. Old paintings too and the detailed marble floors are among the other treasures of this church. The feast day is a chance to enter the Santa Maria Della Salute church up to the Dogana(house of the customs(back in the olden times) which is not open on ordinary days) down to the sacristy and the little passage at the back going out of the sacred building. It felt like a maze to me and made me wonder if there are other "secret passages" and why were they made. The Feast of Salute is, with no doubt, the one with the less tourist impact, recalling a real popular religious feeling. Also such festivity, like that of Redentore, reminds us of another terrible plague occurred during the two-year period 1630-1631, and the succeeding vow made by the Doge in order to get the intercession of the Virgin. Still nowadays on 21st November thousands of citizens march before the high altar of the majestic Salute Church in order to perpetuate the age-old bond of gratitude existing between the town and the Virgin Maria. Those who have the opportunity to be in Venice during the day of Salute can breathe an atmosphere of genuine and heartfelt popular participation, as well as not pharisaic religiosity, but deeply related to the history and traditions of the town. Every year, for this feast, a temporary bridge on boats is built: it crosses the Canal Grande and links the areas of St. Moisè and St. Maria del Giglio (sestiere of St. Marco) to the Basilica of Longhena (sestiere of Dorsoduro), in order to allow the passage of the procession. 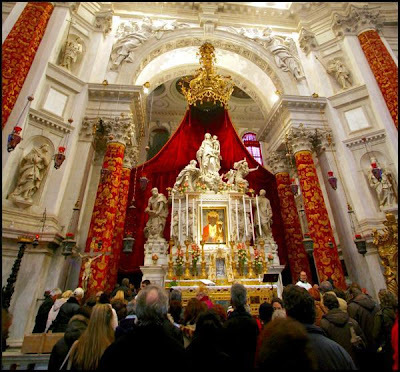 Tens of thousands of people go on a pilgrimage to pay homage to the Madonna and to light a church candle in order to make Her intercede for their good health. The ceaseless queue of people which on 21st November march on the votive bridge made of boats, towards the imposing Salute Church, testifies the still living and strong bond existing between the town and the Madonna. And they even have Sponge Bob Square Pants ( I don't even know if I spelled it right). You are so lucky to be there witnessing all the grandeur of human creations. Just look at the architecture of the churches and buildings. i like the pictures in this entry, lovelyn. you captured the spirit of the event. I particularly liked the church, so elegant and a concrete reminder of the rich history of italy. You know Spongy too hehehe... my 3 boys love Patrick against only only mama for Sponge Bob. Yeah, so thankful that we are here, but if we had the choice, we prefer staying in our mountains there(if there are still some left...lol). Thanks! There are still other shots inside the church- paintings, chandeliers, the marble floor etc... husband said to leave those shots for him to use. parang ang sarap namang maki-fiesta dyan, daming sweets! what i love about italy are their churches, kahit capella lang, ang ganda na! How's the water in sorrounding Venice compared to Pasig River? Am sure it's a lot better but it looks brownish.